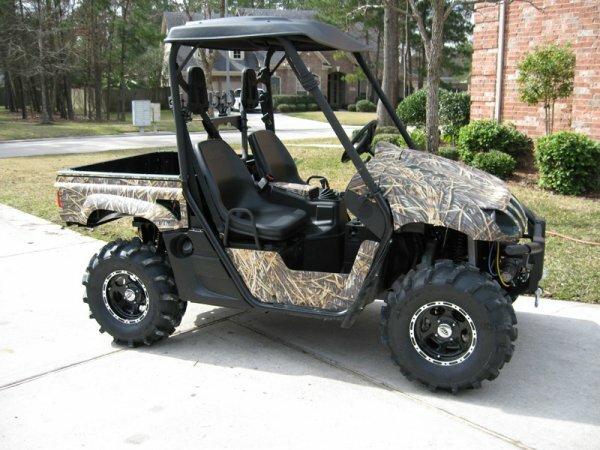 Now you can easily turn your UTV into a rugged hunting machine with camo wraps from Camo4u. These 3M vinyl kits are available in the most popular hunting patterns and are easy to apply. With all the instructions and tools included with your kit, you can now give your UTV a custom finish in Realtree or Mossy Oak. Camo4u vinyl is waterproof, scratch resistant, and guaranteed not to fade in the outdoor elements. This universal camo vinyl kit will fit popular UTVs like the Yamaha Rhino, Honda Big Red, Kawasaki Teryx, John Deere Gator and many others. For more info, visit www.camo4u.com or call them at 434-229-8468.